Several M&M athletes competed at the South of England Indoor Championships at Lee Valley on the 13th and 14th January with some great results. 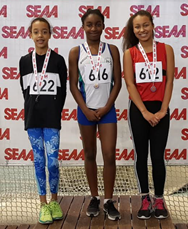 U13 Evie Cameron achieved a 60m PB, 8.70s, further improving her club record and winning a bronze medal. U15 Kieran Isaac ran close to his PB, 7.93s, in the 60m. Kieran also jumped to a PB and a club triple jump record of 10.43m. In the 800m U17 Billie Rouse took another 4 seconds off her recent 800m indoor PB in 2.26.73s and U17 Erin Hughes also with an indoor PB, 2.34.37s. U17 Michael Uzozie ran a pb in the 400m in 55.76s.